An adventure experience in the mystical Uttrakhand starting from Rishikesh and a trek to the highest temple in the world. Come live adrenaline pumping 6 days in the Himalayan environs. Cycling and trekking to Deoria Tal. Trek to the highest temple in the world Tungnath in Chopta. Mountain biking in Chandrapuri and Shivpuri. River rafting in the Grade 3+ rapids. Service of a professional guide. The major attraction of this trip would the trek that leads you to the highest temple in the world “Tungnath” situated at an altitude of 3680 metres, dedicated to Lord Shiva. Your adventure includes trekking, cycling, rafting and camping in Garhwal Himalayas. Enjoy breathtaking views of Himalayan range during this trek. Situated at an altitude of 4,130 metres Chandrashila is the highest point of this trek. Tungnath to Chandrashila trek is covered with snow late Oct till April. Thrilling rafting in Ganges and Mountain Biking would be other adventure activities that you would do in this tour. You would be received by your hosts in Rishikesh between 6-10 am, post which you will be transferred to the transit hotel/ camp. Freshen up and have your breakfast. Enjoy your Himalayan drive along the Ganges. Stop to take a quick photograph at Devprayag (Prayag means confluence to two rivers), here Bhagirathi (originating from Yamunotri glacier) and Alaknanda (originating from Gaumukh Glacier meet). Overnight stay at a small hamlet Sari in a guesthouse. After breakfast enjoy a cycle ride to the nearby forest area followed by 1.5 hours of trekking to Deoria Tal passing through the oak forest. All your tiredness will go away once you reach your destination for the night Deoria Tal at 2438 meters. Enjoy the magnificent view of majestic Himalayan Mountain from here and feel immersed in the beauty of the place. You will be staying overnight at the campsite near Deoria Tal. Enjoy the views of the Himalayan peaks in the morning. On a clear day, you can see many peaks including Choukhamba, Kedar, Neelkanth Parvat. Enjoy your breakfast by the lake afterwards leave for Chopta. Starting with a gentle trail passing through Rhododendron forest you will reach Chopta by late afternoon. Take your bikes to nearby places and enjoy the beauty of the place. You would be staying overnight at the camp near Chopta. After an early breakfast, you start the trek first to Tungnath (highest temple in the world devoted to Lord Shiva), rest for some time and again start the trek towards Chandrashila 4,130 meters. This climb may be little demanding as you will gain 1000 metres in a few hours, however climbing at a slow and steady pace is the way to go. Listen to the instructions from your trekking guide who would be always there to encourage you. Enjoy the breathtaking view of Himalaya from the top. On a clear day, you can see many peaks including Nanda Devi, Trisul, Dunagiri, Hathi Parvat, Neelkanth, Choukhamba and Gangotri peaks! Spend some time on top and later descend towards Chopta. After lunch relax for some time and then enjoy a gentle downhill cycle ride till Kund. Return to Chopta for overnight camping. On day 5, after a nice warm breakfast, you start your return journey to Rishikesh. Ride your bikes along the Himalayan forests and roads. Reach Chandrapuri from where you will board Jeep/ Cab till Kirtnagar. Resume the cycling fun again from Kirtinagar with river Alaknanda flowing alongside. Reach Shivpuri in the evening and relax. Enjoy your evening with a bonfire and some music, share your experience with the team. You will be staying overnight at the camp in Shivpuri. This will be the last leg for your great Himalayan adventure; enjoy 18 km of white water rafting in the Ganges encountering grade 3 rapids. Try cliff jumping and body surfing on the way. Reach NIM beach and drive back to Shivpuri camp. Enjoy your lunch. Time to say goodbye to your Himalayan friends. 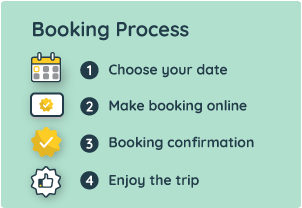 Book with 10% of the total amount if you book more than 20 days in advance. Safety Gloves (if you have). Small Backpack & personal medical kit (if you have). Carry an extra pair of clothing and towels. Management shall not take responsibility for missing items during the trip, hence requested not to travel with too many ornaments, jewellery, cash and other etc. T-shirts, comfortable trekking pants (avoid cotton), jackets - windproof with hood preferable to keep you warm from the cold wind. Trekking shoes with thick soles and most importantly, it should be comfortable. A weightless towel, a water bottle. Lip balm, sunblock, mosquito repellent. Cap is a must under the sun which also includes the sunglasses. At night, a torch is a must. Avoid bringing expensive watches or jewellery for the trek. Note that we are not responsible if it is misplaced.